After three visually impressive but slightly silted issues, DC’s He-Man/Thundercats crossover has finally hit its stride. The awkward lines of dialogue are pleasingly infrequent, and the focus on Lion-O and He-Man gives the issue a sense of cohesion that really works well to draw the somewhat fractured storyline together. Yes, it’s still essentially a case of “let’s watch X fight Y”, but at least there feels like more of a reason for the fisticuffs this time around. Oh, and it doesn’t hurt that co-writers Rob David and Lloyd Goldfine manage to insert a moment of pure unadulterated genius midway through this issue involving Cringer that had me staring at the page for a good minute or so with the same goofy grin that my seven year-old self had sitting in front of the TV watching the He-Man and Thundercats cartoons. Seriously. Awesome stuff, folks. Freddie E Williams II’s bold, in-your face artwork continues to make this one of the better looking comics on the shelves today, with his hulking, larger-than-life characters practically leaping off the page as they do battle. 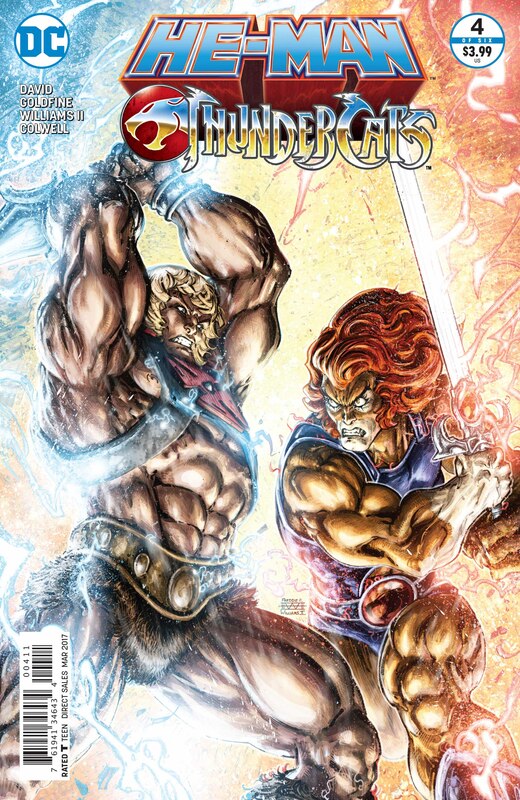 The throwdown between He-Man and Lion-O teased on the cover delivers in spades, and the aforementioned Cringer moment is, as I mentioned, awesome. Williams also finds time to throw in some glorious moments fan service of his own along the way (Clamp Champ and Rio Blast in the houuuuuuuse!) just for good measure. Is it a flawless story? No, not at all. But the more I read, the more I’m starting to understand that it really isn’t trying to be. While Dan Abnett and Pop Mhan set out to create a gripping, boundary-pushing storyline with Eternity War, a story that just so happened to be based in the He-Man Universe, this particular crossover is pure unashamed fan service through and through. And in that respect, this is undoubtedly the strongest issue of the series so far. If you’re looking for complex character work or nuanced storytelling you’ll probably end up disappointed, but if you want a comic that makes you feel like a kid sitting wide-eyed in front of your TV again, this is definitely the series for you.